The Oaks Altair Switched Double Wall Light Is In An Antique Brass Finish With Frosted White Glass Shades. The Oaks Altair Switched Double Wall Light Is In A Polished Chrome Finish With Frosted White Glass Shades. The Oaks Antwerp Double Wall Light Is In An Antique Brass Finish And Is Dressed With Opal Glass Shades And Has An On/Off Pullcord Switch. The Oaks Antwerp Double Wall Light Is In An Antique Chrome Finish And Is Dressed With Opal Glass Shades And Has An On/Off Pullcord Switch. The Oaks Antwerp Single Wall Light Is In An Antique Brass Finish And Is Dressed With An Opal Glass Shade And Has An On/Off Pullcord Switch. The Oaks Antwerp Single Wall Light Is In An Antique Chrome Finish And Is Dressed With An Opal Glass Shade And Has An On/Off Pullcord Switch. The Oaks Armada Double Swing Arm Wall Light is in an Antique Brass finish. The Oaks Armada Swing Arm Wall Light is in an Antique Brass finish. 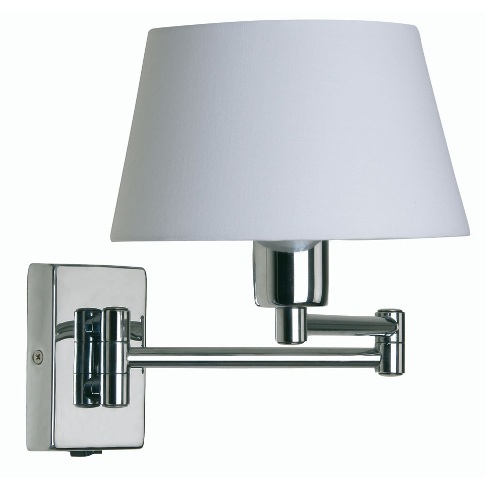 The Armada Double Swing Arm Wall Light is in an Antique Chrome finish. The Oaks Armada Swing Arm Wall Light is in an Antique Chrome finish. 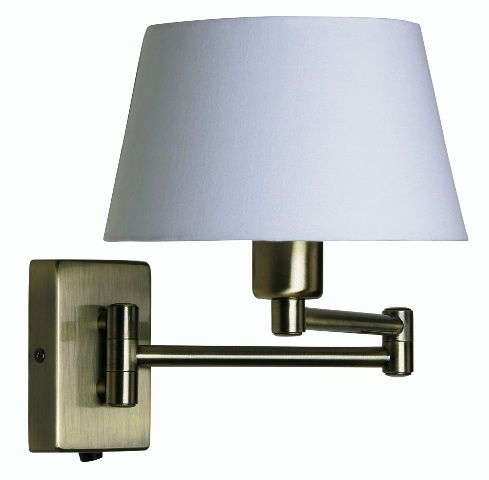 The Oaks Armada Double Swing Arm Wall Light is in a Polished Brass finish with a fabric shade. 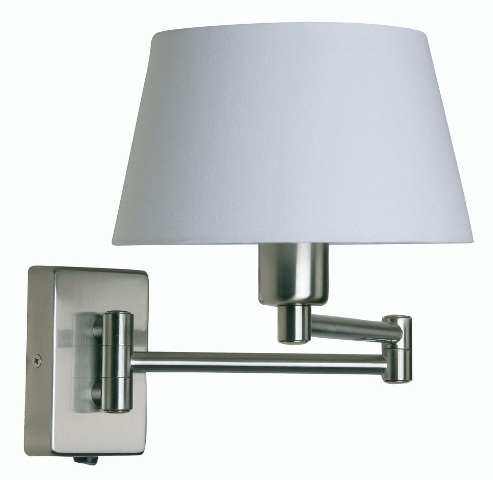 The Oaks Armada Swing Arm Wall Light is in a Chrome finish.with a fabric lampshade. The Kolarz Ascot 0195.61.4 is in an antique brass finish with Murano glass detailing and a cream shade. The Franklite Aspect single spotlight is in a black and gold finish with an adjustable head. The Firstlight Bari Flexi Wall Light is in a Black finish with chrome trim. The Firstlight Bari Flexi Wall Light is in a Brushed Steel finish. The Firstlight Bari Flexi Wall Light is in a white finish with chrome trim. The Oaks Bell Wall Light has a Champagne alabaster glass shade and a pull cord. The Oaks Bell Wall Light has a Frosted alabaster glass shade and a pull cord. The Elstead Belmont Wall Light is in a Brushed Nickel finish with a white polycotton shade and a directional LED reading light. The Elstead Belmont Wall Light is in a Brushed Nickel finish with a white polycotton shade and two directional LED reading lights. The Franklite WB102 Single Wall Light is in a Matt Black and Chrome finish with an off-white shade. The Oaks Bleckley Double Wall Light is in an Antique Silver finish with frilled, ribbed glass shades and a pull cord. The Franklite Bubble FL2401-3 is in a chrome finish with spherical glass shades. The Franklite Chrysalis Wall Light is in a Chrome finish with small clear glass shades lined with tiny crystals. The Franklite Chrysalis Wall Light is in a Matt Gold finish with small clear glass shades lined with tiny crystals. The Franklite Clemmy Double Switched Wall Light is in a Bronze finish with flared clear glass shades. The Franklite Clemmy Single Switched Wall Light is in a Bronze finish with a flared clear glass shade. The Franklite Clemmy Double Switched Wall Light is in a Matt Gold finish with flared clear glass shades. The Franklite Clemmy Single Switched Wall Light is in a Matt Gold finish with a flared clear glass shade. The Franklite Clemmy Double Switched Wall Light is in a Satin Nickel finish with flared clear glass shades. The Franklite Clemmy Single Switched Wall Light is in a Satin Nickel finish with a flared clear glass shade. The Oaks Fern Wall Light is in a lantern design and an Antique Brass finish, with clear glass panels and a pull cord. The Oaks Fern Wall Light is in a lantern design and an Antique Chrome finish, with clear glass panels and a pull cord. The Oaks Finlay Swing Arm Wall Light is in an Antique Brass finish with a fabric shade. The Oaks Finlay Swing Arm Wall Light is in an Antique Chrome finish with a fabric shade. The Firstlight Focus LED Switched Single Spotlight is in a Chrome finish with a clear acrylic bubble shade. The Oaks Hamburg Wall Light is in an Antique Brass finish with a glass shade. The Oaks Hamburg Wall Light is in an Antique Chrome finish with a glass shade. The Oaks Hamburg Wall Light is in a Polished Chrome finish with a glass shade. The Franklite Harmony Double Wall Light is in a Bronze finish with alabaster effect glasses and a pull cord. The Franklite Harmony Double Wall Light is in a Satin Nickel finish with alabaster effect glasses. The Firstlight Kent LED Wall Light is in a Polished Stainless Steel finish and is backlit. The Firstlight Langham Double Wall Light is in an Antique Brass finish with pleated shades, glass accents and a pull cord switch. The Firstlight Langham Single Wall Light is in an Antique Brass finish with a pleated shade, glass accents and a pull cord switch. The Firstlight Lex Wall Light is in a Polished Stainless Steel finish with a cream fabric shade and LED reading light. The Firstlight Lex Wall Light is in a Polished Stainless Steel finish with an oyster fabric shade and LED reading light. The Franklite WB103 Wall Light is in a Matt Black and Chrome finish with a white acrylic shade and a switch on the base. The Oaks Nador Double Wall Light is in a traditional design and an Antique Brass finish with a pull cord. The Oaks Nador Single Wall Light is in a traditional design and an Antique Brass finish with a pull cord. The Oaks Nador Double Wall Light is in a traditional design and a Gold finish with a pull cord. The Oaks Nador Single Wall Light is in a traditional design and a Gold finish with a pull cord. The Franklite Neo Double Wall Light is in a Bronze finish with dimpled glass shades and detachable crystal glass drops. The Franklite Neo Single Wall Light is in a Bronze finish with a dimpled glass shade and a detachable crystal glass drop. The Franklite Neo Double Wall Light is in a Chrome finish with dimpled glass shades and detachable crystal glass drops. The Franklite Neo Single Wall Light is in a Chrome finish with a dimpled glass shade and a detachable crystal glass drop. The Oaks Nino Antique Brass Double Wall Light is dressed with double glass shades. The Kolarz Nonna Blue Flowers Switched Swing Arm Wall Light is an Antique Brass finish wall light supporting a white glass shade with a blue flower design. The Kolarz Nonna Single Wall Light is an Antique Brass finish wall light supporting a white glass shade with a blue flower design. The Franklite Ocarina FL2404-2 is in a chrome finish with wire pod shades. The Oaks Ofira Double Wall Light is in an Antique Brass finish with double glass shades. The Oaks Ofira Double Wall Light is in a Chrome finish with double glass shades. The Oaks Ofira Double Wall Light is in a Mirror Black finish with double glass shades. The Franklite Omni Double Wall Light is in a Bronze finish with dimpled glass shades and crystal glass drops. The Franklite Omni Single Wall Light is in a Bronze finish with a dimpled glass shade and a crystal glass drop. The Franklite Omni Double Wall Light is in a Chrome finish with dimpled glass shades and crystal glass drops. The Franklite Omni Single Wall Light is in a Chrome finish with a dimpled glass shade and a crystal glass drop. The Oaks Orin LED Swing Arm Wall Light is in an Antique Brass finish. The Oaks Orin LED Swing Arm Wall Light is in an Antique Chrome finish. The Firstlight Orion LED Flexi Reading Wall Light is in a Bronze finish. The Firstlight Orion LED Reading Wall Light is in a Bronze finish. The Firstlight Orion LED Flexi Reading Wall Light is in a Brushed sSteel finish. The Firstlight Orion LED Reading Wall Light is in a Brushed Steel finish. The Firstlight Orion LED Flexi Reading Wall Light is in a Chrome finish. The Firstlight Orion LED Reading Wall Light is in a Chrome finish. The Oaks Oslo Double Wall Light is in an Antique Brass finish with slim glass shades and a pull cord. The Oaks Oslo Double Wall Light is in an Antique Chrome finish with slim glass shades and a pull cord. The Oaks Pandora Double Wall Light is in an Antique Brass finish with double glass shades and a pull cord. 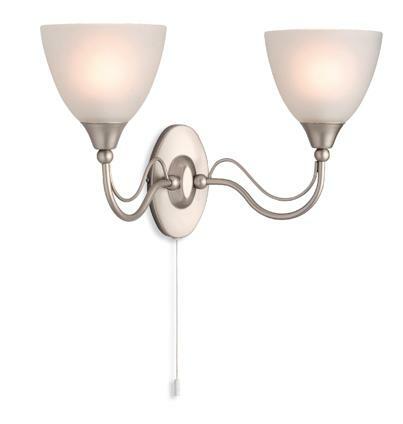 The Oaks Pandora Double Wall Light is in an Antique Chrome finish with double glass shades and a pull cord. The Oaks Pandora Double Wall Light is in a Mirror Black finish with double glass shades and a pull cord. The Franklite Piccolo FL2405-2 is in a satin nickel finish with smoked glass shades. The Franklite Ripple Double Wall Light is in a Bronze finish with clear ribbed glass shades. The Franklite Ripple Single Wall Light is in a Bronze finish with a clear ribbed glass shade. The Franklite Ripple Double Wall Light is in a Satin Nickel finish with clear ribbed glass shades. The Franklite Ripple Single Wall Light is in a Satin Nickel finish with a clear ribbed glass shade. The Firstlight Ritz Wall Light is a flexi LED wall light in a Brushed Nickel finish. The Oaks Sahar Double Wall Light is in an Antique Brass finish with crystal glass shades and drop and has a pull cord switch. The Oaks Sahar Single Wall Light is in an Antique Brass finish with a crystal glass shade and droplet and has a pull cord switch. The Oaks Sahar Double Wall Light is in a Chrome finish with crystal glass shades and drop and has a pull cord switch. The Oaks Sahar Single Wall Light is in a Chrome finish with a crystal glass shade and droplet and has a pull cord switch. The Firstlight Santana Double Wall Light is in a Satin Steel finish with acid glass shades and a pull cord. Luxury Lighting offer a range of switched wall lights for people who require a wall light with an on/off switch. These wall lights with switch come in many designs and various finishes to suit your requirements. All the lights in this category have an inbuilt rocker or pullcord switch.